Franklin Marine – Quality Marine Chandlery & Fishing Supplies | Beside the Huon River, Franklin Tasmania | Canoes and Kayaks | Expert Advice and Service for all Your Boating and Fishing Needs"
Hauling in a fish with a landing net sounds like child’s play, doesn’t it? Not quite. You’d be surprised to know how often things go wrong in those heated moments of excitement. When your biggest catch makes it into view after a wreslting match, your natural instinct tells you to yank it out of the water as quickly as you can. Unfortunately, that can, and regularly does, end badly. Before getting your net wet, remember that using a net to secure a fish is nothing like catching butterflies. No amount of swooping, swooshing, dipping or scooping will get you anywhere. Put the net in the water, fully submerged so that the back of the hoop (where the handle connects) is sitting flush with the surface. Relax pressure on the line as soon as the head of the fish and half of its body is over the front of the net hoop. This should cause the fish to swim deeper into the net, allowing you to smoothly lift the net out of the water – with the fish in it! Never chase a fish with a net, and never attemp to net a fish tail-first. Fish can swim much faster than we can move a net through the water, so this will almost always end in misery. A larger net with a wider hoop can be easier to use. For fish over 20kg, no net is going to be any use. Always carry a gaff just in case you get lucky with that fish of a lifetime. When shopping for a net, make sure you find one that is well made and has a study handle. As discussed above, a larger net can be easier to use, so try and find one on the larger side. Also consider a knotless net as they are nicer to fish and also less likely to tange with loose hooks. A good net can be a significant investment for your tackle collection, but it can and will prove worth it if used correctly. Franklin Marine stocks quality fishing nets and gaffs. Please share this with any people you know that may benefit from these tips! We’re sure you’ve been here – at the boat ramp, ready to launch… Stuck behind someone who is taking their sweet, sweet time to get their boat in the water! It’s a frustrating situation, but it doesn’t have to end in tears – or ‘ramp rage’. The most common cause of ‘ramp rage’ comes about when people back their trailer onto the launching ramp and then stop to load their gear, untie their tie-down straps, screw in the bungs, prep the engine and more. This all happens while there are people, waiting to launch or retrieve their own boats, more than likely with their patience wearing thin. This issue is easily avoidable if you go through your ‘pre-launch checklist’ before hitting the launching ramp! You want to be spending as little time as possible on the launching ramp. This pre-launch checklist should give you a good starting point, but build on it if you need to. Make sure all of your gear is stowed securely in the boat. If your boat hasn’t been run in a while, fire up the engine for a few seconds to ensure all systems are operational. A few seconds of dry running won’t hurt the engine, and it’s better to know if you have a flat battery or have lost the kill switch lanyard before you launch! NOW you are ready to hit the launch ramp! If you’re new to launching a trailer boat, don’t stress! We all had to learn the ropes once. Devise a ‘procedure’ as to how you launch and retrieve. Head to the ramp on a quiet day and just practise launching and retrieving your boat. It may sound silly, but how did we all learn to park? Practise, (hopefully) somewhere quiet! Once you are comfortable doing this, it’s time for the real thing! Don’t get overwhelmed. A busy boat ramp can be stressful, boat don’t let it get the better of you. Remember your practise and how comfortable you were by the end of that. The only thing that has changed is that there are more people around now. Stick to your procedure and you’ll be fine! You’re bound to hit some snags when you’re still getting used to it, so don’t be afraid to ask for help if you get stuck and there are other people around. They’ll usually be delighted to speed things up so they can get their boat in or out quicker! Don’t forget we all started somewhere – if you’re watching someone take their time and they could clearly use a hand, offer your help rather than getting frustrated. A little can go a long way! Don’t forget to share this article with your friends that could benefit from these tips! 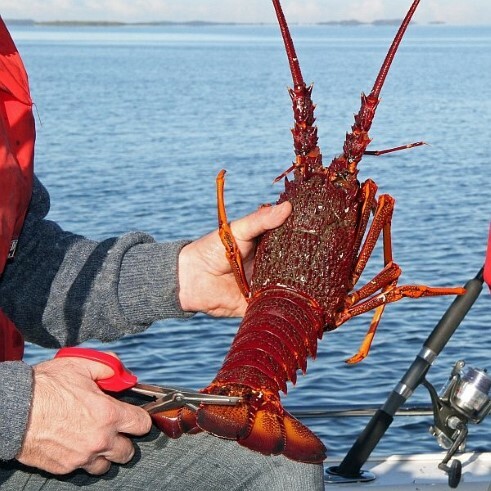 The Tasmanian Cray Fishing season is approaching fast! How do I identify a male from a female? Where can I use Cray Rings & Pots in local waters? How do I correctly measure and mark a Southern Rock Lobster? Does my cray gear comply to regulations? Licence: Rock lobster pot, ring or dive licence required. You must be 10 years or older to hold a rock lobster licence. Season: See Recreational Fishing Seasons. You may only possess a rock lobster pot on state waters from 6am the day before the season opens and only set a pot after 1pm on the same day. Pots may then be pulled after midnight. Identifying features: These large, spiny crustaceans are orange-red in colour with a rough textured shell, being darker red in shallower waters to almost white in very deep waters. Their features include a tough carapace, long antennae, eyes on moving stalks, six small limbs around the mouth, five pairs of walking legs and a segmented tail ending in a fan with swimmerets underneath. Grows to: 220 mm in carapace length and 5 kg. Habitat: Found around Tasmania near rocky reefs and in crevices from close inshore out to 200 metres depth. After hatching, the young larvae undergo several complicated life stages for between 9-24 months. Fishing information: Rock lobster are highly sought after by recreational fishers who use pots and rings and also dive to catch this species. Popular baits used include fish heads and frames and occasionally raw meats. They are opportunistic carnivores consuming species such as mussels, abalone, sea urchins, crabs and worms. Predators of rock lobster include octopus, sharks and fish species such as wrasse, ling and cod. Responsible fishing tips: Rock lobsters are fragile so handle carefully, particularly when they have eggs attached or have recently moulted. Sort your catch quickly as they can die if left exposed to warm, dry air. Release them gently over the reef where they were caught. If you catch a tagged lobster, please record the tag details and report to the Institute for Marine and Antarctic Research. Bag limit: Eastern Region 2, Western Region 5, northern Bass Strait 2 (above 39°33’). These limits apply to all rock lobster species combined. Possession limit: Eastern Region 4, Western Region 10, northern Bass Strait 4 (above 39°33’). Special rock lobster licence holders (Western Region only) -15 rock lobster for a 14 day period. A possession limit of 10 applies on mainland Tasmania, islands in the Western Region and on Flinders, Cape Barren and Bruny Islands including homes, shacks and vehicles. Eastern Region possession limits apply within 100 metres of unloading any rock lobster, except where the fisher’s shack or home is within the 100 metres. Non-licensed possession limit – 2 rock lobster. Children under 10 cannot possess rock lobster. These limits apply to all rock lobster species combined. Boat limit: Eastern Region 10, Western Region 25, Northern Bass Strait as per region. 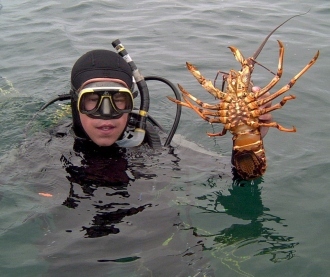 Handling: Be careful when handling rock lobsters as they have sharp spines around the base of their antennae. Public Health advice: Follow any public health alerts relating to eating wild shellfish – refer to the Department of Health and Human Services or phone their hotline on 1800 671 738. Cooking: Rock lobster has firm, white meat with a rich medium flavour. It has a low oil content and is suitable to simmer, steam, grill or barbeque. Measure the carapace length with an accurate ruler. 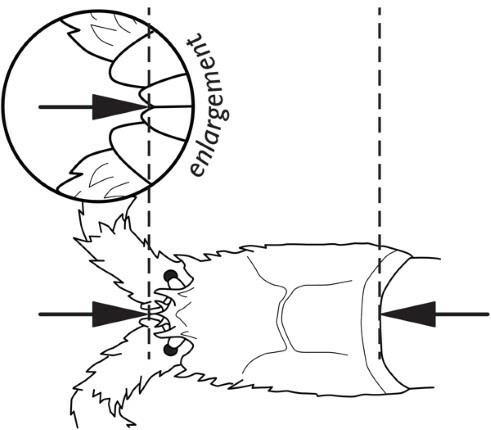 Place the tip of the measure between the antennal horns so that it fits hard into the middle notch. If the other end of the measure reaches beyond the rear edge of the carapace, then the rock lobster is not legal size. 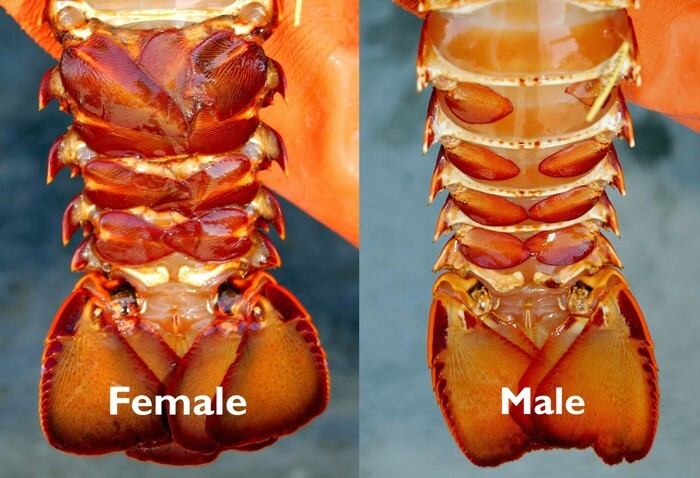 Male rock lobster must be at least 110 mm and female rock lobster at least 105 mm. If the rock lobster is not of legal size, it must be returned gently to the water immediately in the area from which it was taken. 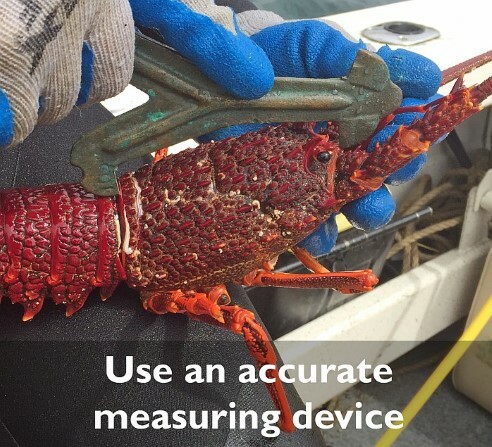 If you are taking rock lobster close to minimum size, be sure your measuring device is accurate. The central flap of the tail fan should be cut clear away with a cut just behind the fleshy portion. You may find it easier to use scissors rather than a knife. Alternatively, you can punch a clear 10 mm hole in the central tail flap. If you are fishing from a boat, the tail fan should be marked within 5 minutes of the lobster being brought to the boat and before landing to shore. If you are fishing from the shore, lobster should be marked within 5 minutes of landing and within 50 metres of the place where you are fishing. Females: have large swimmerets under the tail with a slender rod (which holds the eggs) under each swimmeret. A small nipper claw is present on the ends of the rear legs. Males: have small swimmerets under the tail and no rods or nipper claws on the rear legs. The following gear may be used to take southern rock lobster (also referred to as crayfish) and eastern (green) rock lobster. You may take rock lobster by SCUBA and surface air, as well as snorkelling, are allowed. The only aid that can be used for taking rock lobster is a gloved hand. Nooses, gaffs, nets, hooks and spears are not permitted for taking lobster. It is illegal to possess a noose on a boat unless it is being used for game fishing. Rings and pots may be used from a boat that is being used by divers. has the licence number clearly marked in figures not less than 70 mm high and 12 mm wide. no other markings on the buoy are allowed. A rock lobster cauf is a device for holding rock lobster in the water. It must be marked with a yellow buoy. A person may only use one cauf at a time. A cauf may be used by more than one licensed fisher but rock lobsters held in a shared cauf must be distinguishable from other fisher rock lobster by being separated into their own compartments, each marked with the fisher’s licence number. Each fisher must have their own yellow marker buoy marked with their recreational fishing licence number (rock lobster pot, ring or dive) attached to the cauf. All rock lobster in a fish cauf need to be tail clipped and count towards the fishers possession limit. Rock lobster rings may be used in all waters apart from some Marine Reserves and Fisheries Research Areas. 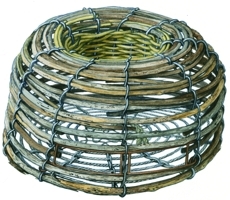 Rock lobster ring or hoop nets can be used to take rock lobster. A licence is required, which allows you to possess and use up to 4 ring nets on state waters. A person in charge of a boat must not allow more than 20 rock lobster rings to be on or used from their boat and all licensees must be present. if left unattended, each ring must have a buoy attached marked with the licence number. 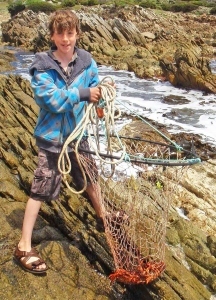 A rock lobster, cray ring or hoop net is a pocket of netting attached to a single steel ring of not more than one metre in diameter. Three or more lines are attached to the ring and joined above the centre of the ring to a small float which acts as an attachment point for the buoy line. A line is tied across the ring to enable bait to be attached. How it works Rock lobster rings are used only by recreational fishers in Tasmania, more commonly in shallow waters. They are deployed from the shore or at a depth range where the fisher can observe them using an underwater viewer. The baited ring is set on the sea floor on habitat preferred by rock lobster such as rocky reef. The bait provides a plume of scent in the water that attracts the lobster into the middle of the steel ring where it becomes enmeshed. When a rock lobster is observed by the fisher to be feeding on the bait, the metal ring is then lifted trapping the rock lobster in the pocket of netting hanging under the ring. They are unable to escape due to the water movement on them as the ring is pulled to the surface or because they have become entangled in the mesh. No objects, such as bait sticks, may obstruct the opening. You cannot recreationally fish for rock lobster or have a recreational pot or ring on a commercial fishing trip. You cannot use rock lobster for bait. is specifically designed as a buoy. floats on the surface of the water. is at least 195 mm in diameter at the widest point. has no markings other than the licence number. Must be marked with the licence number and the letter “P” for pot. See licencing page for marking details. Cray pots can be used south and east of the prohibited areas. The southern boundary is a line from Scotts Pt to the northern tip of Partridge island, and then from the southern tip of Partridge Island south to Labillardiere Peninsula on Bruny Island, and a northern boundary being a line from Dennes Pt to Piersons Pt. The River Derwent upstream from an imaginary straight line drawn from Dennes Point to Cape Direction. No swimming, diving, netting, potting or rings and no take or possession of abalone and rock lobster within the reserve. Also, no taking, fishing or possession of abalone and rock lobster whilst swimming or diving within 200 metres of Taroona Waters reserve. No fishing or setting of fishing gear. No swimming, diving or anchoring. No fishing or setting of fishing gear in part of the reserve. 5 rock lobster pots and 20 rock lobster rings. Aborigines engaged in aboriginal fishing are exempt from holding a fishing licence, but must comply with all other rules. Where rock lobster gear must be marked with a licence number, Aboriginal fishers should use the unique identifying code supplied to them by a recognised Aboriginal organisation or DPIPWE. More information on Aboriginal fishing. It is illegal to take rock lobster by a hook and line, or a net. If you leave your rock lobster pot in the water for longer than allowed due to bad weather, illness or theft, contact the Marine Police on 0427 655 557 or your nearest Police Station and provide them with your licence number. Cray pots, cray rings, floats, ropes, clips and Cray Bait are all available at Franklin Marine. Call in on your way south – we’ve got plenty of room for you to pull in with the boat! So get ready for the season – don’t forget check Life Jackets and your boat over for safety! New Navigation Marks in the Upper Huon River! A successful submission from Franklin Marine – supported by the Franklin boating community – for funding to establish more navigation marks on the The Huon River, has been successful – and we’re happy to report that the new marks have now been installed! The funding for this project came from the MAST Recreational Boating Fund, which puts your boat license fees to good use by investing in local boating safety projects such as these. 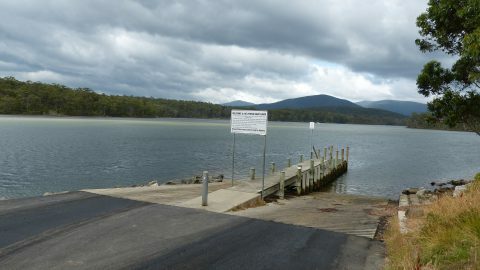 The aim was to establish more 5 new navigation marks on the formerly difficult Port Huon to Franklin route up The Huon River. With winter closing in on the Huon Valley, we are once again being met by chilly evenings and mornings. Of course, no chilly evening or morning would be complete without a thick blanket of fog rolling down the river! This makes for a good photo (if you can brave the cold!) – but what if you get caught out in your boat as it rolls through (and subsequently impairs your vision)? Anticipate if it will be foggy. The BOM (Bureau of Meterology) publishes weather forecasts on their website. Keep an eye on your local forecast – the page usually explicitly states “morning fog & frost” on the right hand column. Click here to see the BOM website. No noise distractions – ask your crew to be quiet & TURN OFF THE STEREO. Turn off the cabin lights – let your eyes adjust. Use head torches with a red light option. Get out of the cabin and listen to the shore. Fog horns are great if you are in an area with traffic. There are international sound signals – see the picture on the right. Keep your navigation lights on at all times – even during the day. A good plotter will help if the charts are up to date and accurate (see why we recommend Navionics Platinum Plus here). Radar is obviously great if you’re lucky enough to have it. Don’t get caught up in the screens! Use them to supplement your navigational skills – not as a replacement for them. GO SLOW AND KEEP A VERY SHARP LOOK OUT. DO NOT LOCK YOURSELF IN THE CABIN WITH THE LIGHTS ON. GET OUTSIDE AND USE YOUR SENSES. So that’s it – be careful and you will ghost out of the fog. Did these tips help you? Please let us know in the comments – and please do share any of your tips for boating in the fog. We would love to hear them! This audio is an excerpt from our weekly “Fishing and Boating Show” – click here for more about the show. Most boats should have at least a neutral buoyancy. This means that a boat should continue to float, even when it is full of water and upside-down. West System is the longest established epoxy resin system for boat building and is a favourite amongst professional boat builders and shipwrights. Shipwrights prefer WEST System because it is always consistent and the mix always cures correctly. What makes a great sailing hat? Raymarine Update: Augmented Reality for Dragonfly & Wi-Fish! Raymarine have just released an update to their free Wi-Fish app that works with the Dragonfly PRO and Wi-Fish systems. The update adds an “Augmented Reality” feature that takes advantage of your smartphone or tablet’s GPS, Compass and Camera functions to create a next-generation marine navigation experience. One of the great features of Raymarine Marine Electronic products is their constant research and development into making existing equipment do more for their owners. This is delivered in the way of free software updates that you can install yourself.